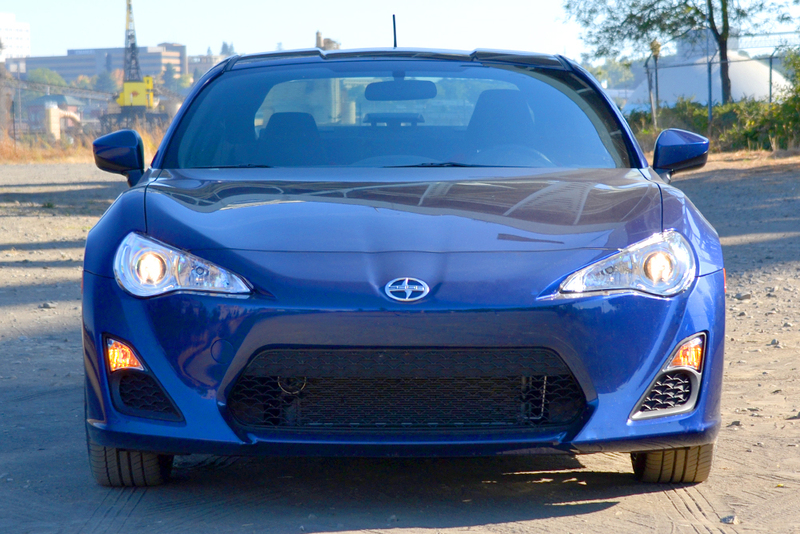 The Scion FR-S is quick, not fast, and that’s perfectly okay given that this is a car that aims to keep things simple, fun, and affordable. It’s hard to believe now, but back in the day Toyota made some pretty decent sports cars. Models like the Celica, Supra, and the 2000GT are reminders of what the Japanese automaker was and is capable of producing. Sadly, these sporty specimens have all gone to the big scrapyard in the sky (at least for now). But while we probably won’t be seeing the aforementioned nameplates being brought back from the grave anytime soon, Toyota, along with partners Subaru, has decided to deliver a performance-oriented, rear-wheel-drive coupe that aims to inject some fun and excitement into both companies’ lineups. 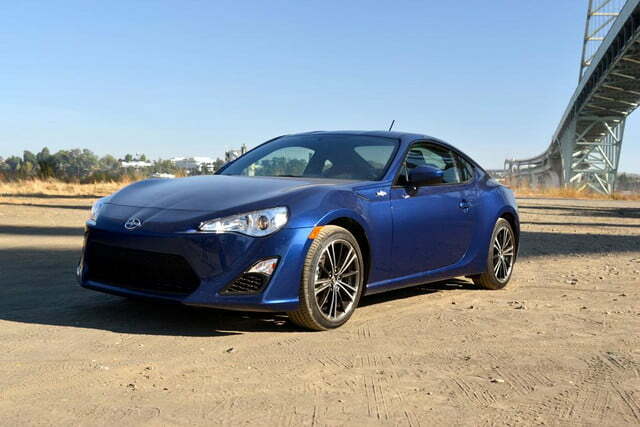 The collaboration has borne three cars: the Scion FR-S, Subaru BRZ, and the Toyota 86, with the last being confined to Australian and Japanese markets only. 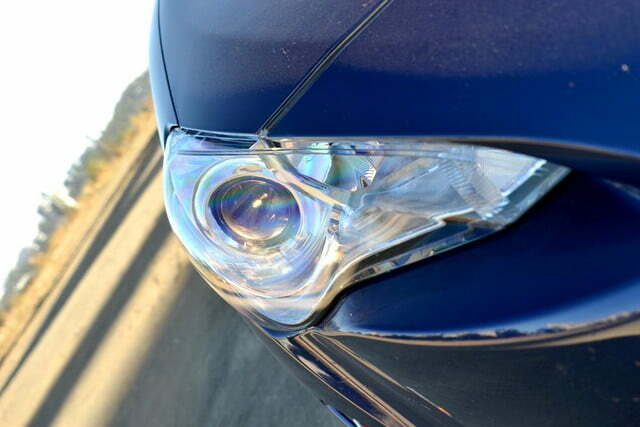 Our first encounter with this eagerly anticipated duo sees us clamber into the youth-oriented, Scion-badged 2013 FR-S. Does this collaboration between two of Japan’s most prominent car manufactures bear fruit, or are we looking at a fantastic flop? 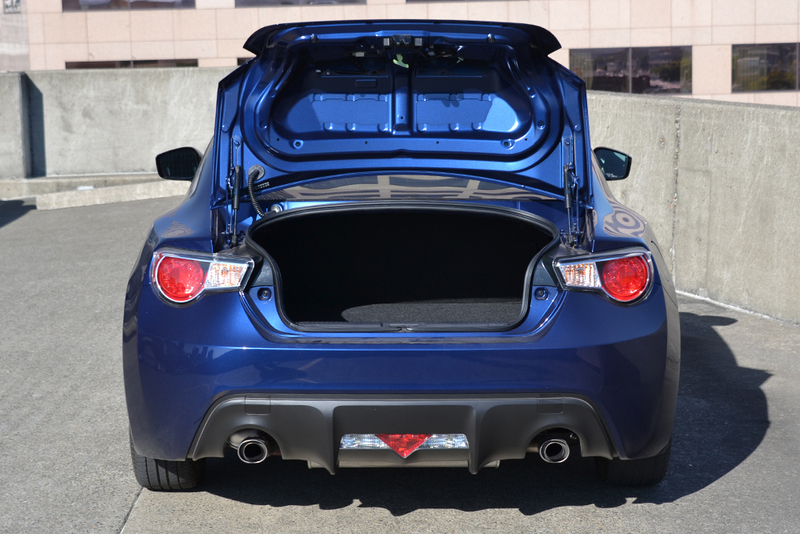 From an engineering perspective, the FR-S is primarily focused on performance and handling over everything else, and that’s readily evident when stepping inside its no-frills cabin. You won’t find a navigation system, touchscreen, or sunroof inside this sporty Scion. Instead you’re treated to some well-appointed plastics, cheesy, but still appreciated carbon-fiber detailing on the dash, and a set of comfortable racing seats that remain pleasant even during longer drives. Other little details hammer home the racing vibe, including race-inspired red stitching on leather-wrapped steering wheel, gear, shifter, and seats, as well as a track-inspired instrument gauge cluster that puts the tachometer front and center. Interestingly the FR-S’ interior never really feels pedestrian, but overlooks a softer aesthetic in pursuit of a purer, sportier one. 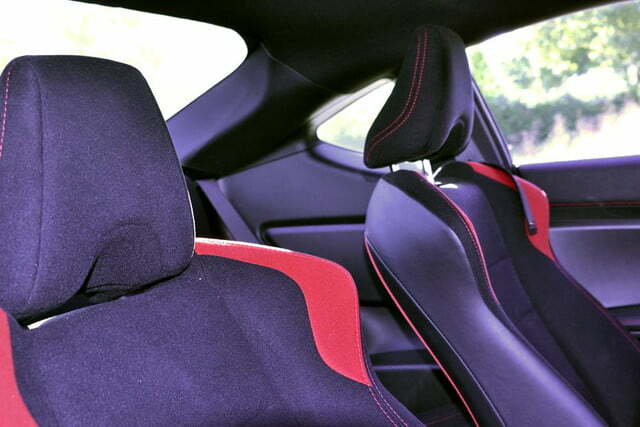 That’s not to say the interior of the FR-S is poor or even uncomfortable, but if you’re looking for a cabin that will pamper you from head to toe, this is not the car for you. With so many interiors sporting the latest tech and electronics, it’s refreshing in many ways to see a sports car that strips away the layers of added fluff in search of a more pure aesthetic. 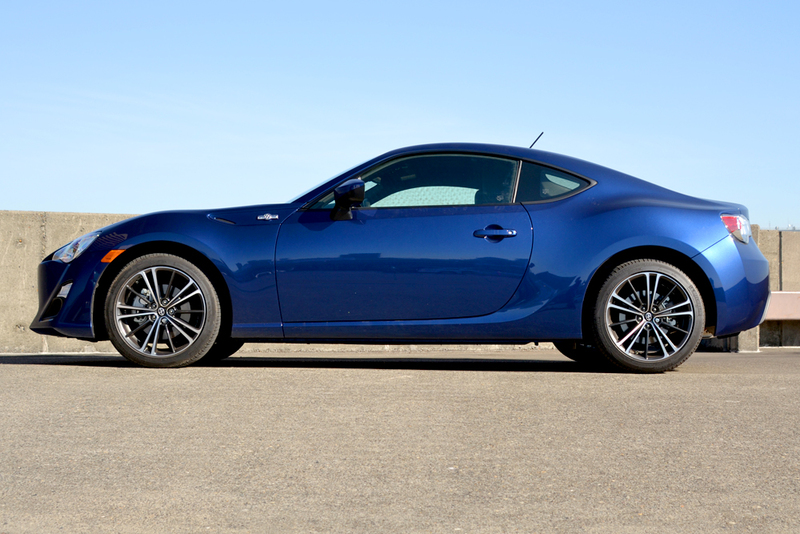 Nevertheless, the FR-S isn’t a barren tech wasteland devoid of any creature comforts. Our review model came equipped with a 300-Watt Pioneer stereo head unit. Standard features included Bluetooth phone and audio capabilities. 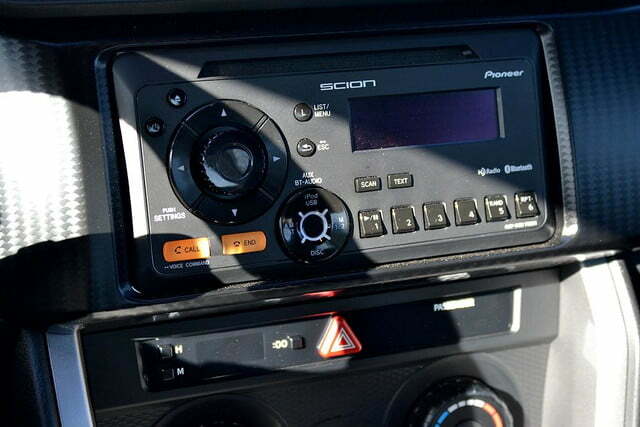 Scion does offer an upgraded unit that features more advanced features such as navigation, Facebook, and Yelp, but sadly these features were absent from our review unit. 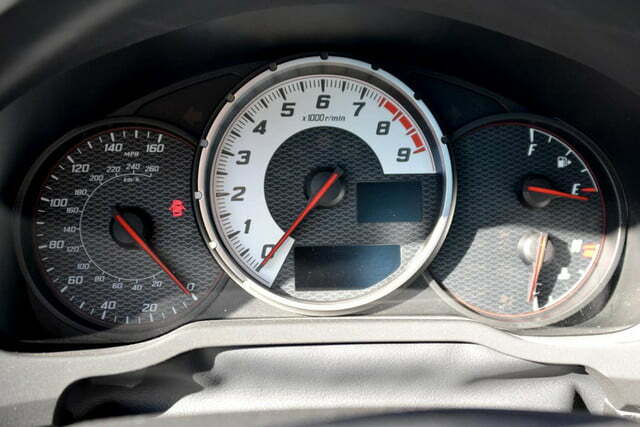 Overall we found the features that our FR-S did have worked relatively well. Syncing and playing audio from our iPhone and iPod was simple, and the eight-speaker sound system delivered a raucous listening experience, even if was rather bass heavy. Because of the small screen, track information is largely limited, but offers up enough real estate to deliver the basics. The buttons, however, are all very small and bunched frustratingly close together. This isn’t a huge issue when stationary, but while driving they can become difficult to operate. And you can forget about steering wheel controls because, well, there are none. Stepping out of the vehicle, you’d be forgiven for failing to notice the differences between the Scion and its near-identical Subaru twin, but they’re there if you know where to look. 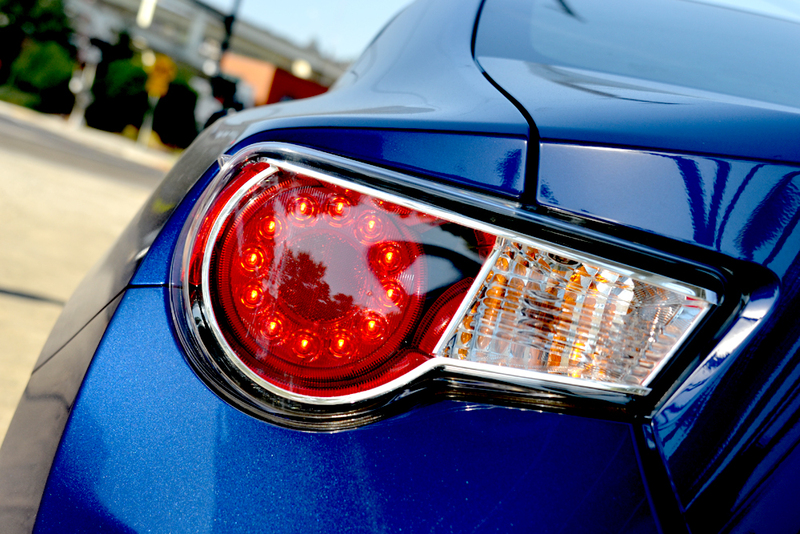 The Scion gets its own, if ever so slightly, distinguishing front and rear-end styling. In addition to the obvious Scion badging, the FR-S sports an inverted trapezoid grille as opposed to the more hexagonal shape of the BRZ, while the rear exhibits a dual-exhaust outlet and other aerodynamic details. Altogether, the design works extremely well and delivers a vibrant, youthful appeal. 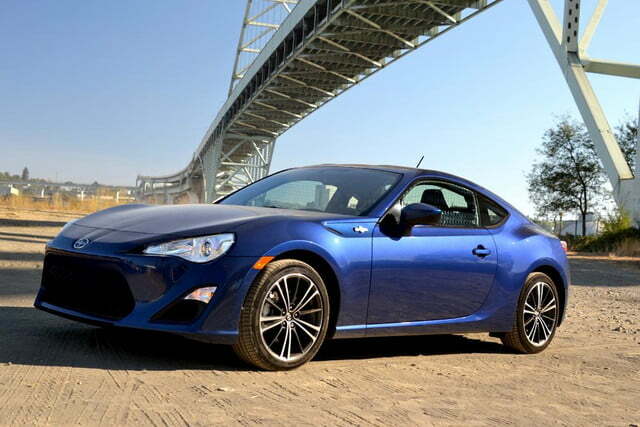 Scion has traditionally targeted the younger crowd and there is no reason to believe it has missed the mark with the FR-S.
Let’s clear this up right now, the Scion FR-S is quick, not fast, and that’s perfectly okay given that this is a car that aims to keep things simple, fun, and affordable. Powering the little sports coupe is a 2.0-liter “boxer” four-cylinder capable of creating 200 hp and 151 pound-feet of torque. 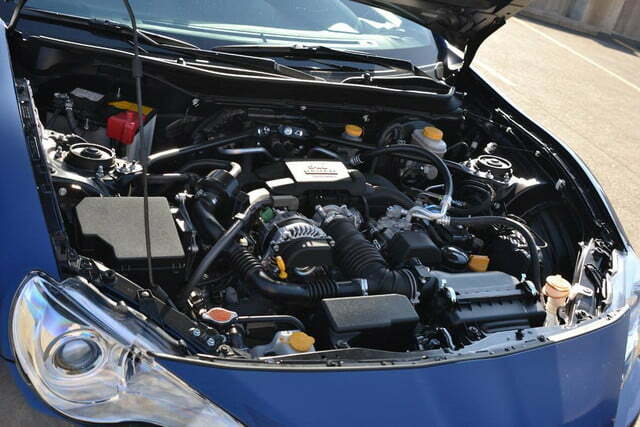 Power is sent to rear wheels via a six-speed manual transmission, or six-speed automatic. Our review model came outfitted with the latter (thank the automotive gods) and proved surprisingly spirited off the line. Again, we don’t recommend pitting the FR-S against larger, throatier Stangs or Camaro’s, but the Scion will deliver enough pizzazz and punch for drivers looking for a livelier ride. And with EPA estimated fuel economy sitting pretty at 22 mpg in the city, 30 on the highway, and 25 mpg combined, the FR-S shows it can be almost as practical (and a helluva a lot more fun) getting you to and from the office as it is the track. Spring for premium fuel and those EPA estimate rise to 25/34/28. Easily its bread and butter, the handling dynamics of the 2013 Scion FR-S cannot be overstated. Here Toyota, and to some degree Subaru as well, must be credited with delivering one of the purest and most rewarding driving experiences we have had in some time. The front tires grip the road with a great deal of authority and entering into sharp corners barely causes the FR-S’ tightly tuned suspension to sweat. Cabin sway is almost non-existent and the FR-S has the uncanny ability to keep you nestled comfortably within its confines. With that being said, the FR-S won’t light up the track with its blazing speed, it’s acceptable and nothing more; it lacks that next-level gusto down the straights. But this machine was really built for driving dynamism. With every corner, every turn, you feel the engineering ethos coursing through this vehicle. What’s more, it’s easily accessible, both in price and driving mechanics, and proves equally rewarding when faced with the more banal everyday driving routes many of us find ourselves in time and again. The FR-S was never intended to blaze down the speedway with any sort of supercar gusto. Its natural environment is the serpentine roads found outside the city. 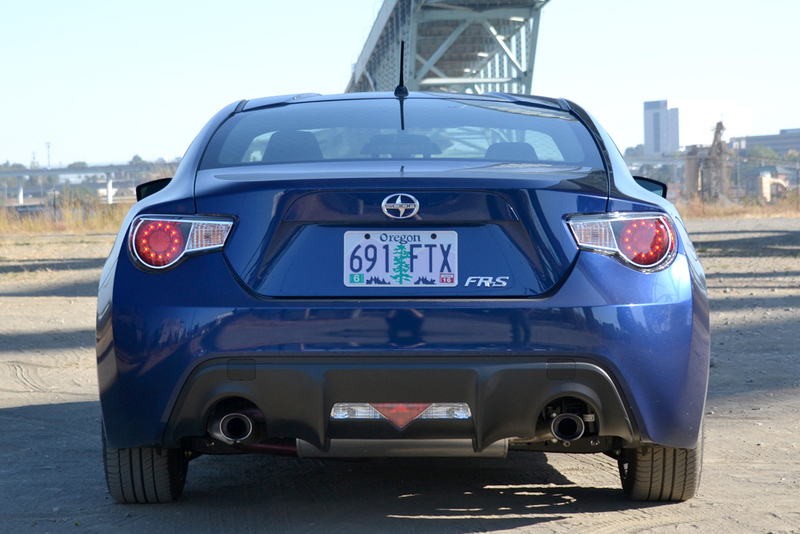 Here handling is preferred to horsepower, and the FR-S manages to dice up turns like a sharp, four-wheeled knife. It won’t deliver the powerful pedigree of a modern pony car, but it will delight drivers with keen reflexes, excellent handling, and a sporty character all of its own. Add to that an extremely attractive $25,000 price point and it’s hard to argue against Toyota and Subaru’s ambitious project. 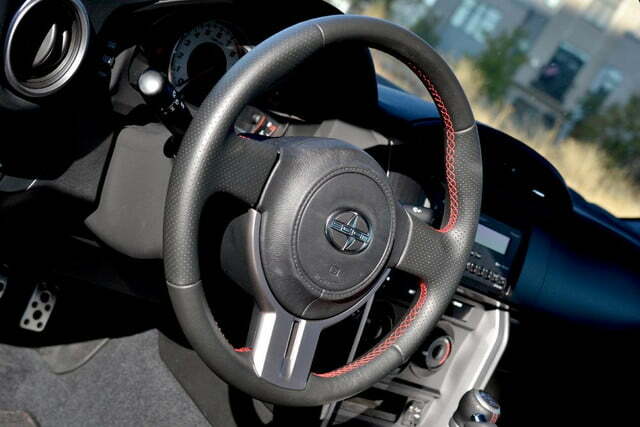 There is no denying that other more powerful options exist, but if you’re on a much more realistic budget, and you want to become one with the road, we can’t think of a more honest, affordable, and above-all enjoyable sports coupe than the 2013 Scion FR-S. Simply put, it’s the Porsche 911 for the rest of us. For more pictures, check out our 2013 Scion FR-S photo gallery.